According to incomplete statistics, Vovinam is present in over 50 countries and regions across five continents. Vietnam had, of course, we feel proud martial tradition is more loving world. Many foreign students on training land of Vietnam and some coach Vovinam was invited to Europe, Asia and Africa seeking distant to promote a culture of the country and people of Vietnam Male. Besides, Vovinam has been present in Asian Indoor Games in 2009 and two SEA Games (2011, 2013); many international competitions were held such as the World Championships, European Championships, Asian Championships, the African champions, champions of Southeast Asia and is part of the official competition of the Asian Beach Games 2016. From the aforementioned encouraging results, Vovinam is trying to continue participation in the SEA Games 29 and beyond are striving to break into the Asian Games arena. 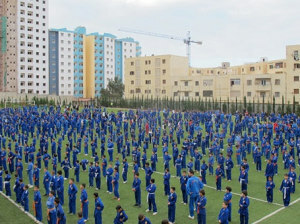 Over 2,000 students Vovinam martial arts training center in Algiers. In Asia, outside of Vietnam, Vovinam has appeared in Afghanistan, India, Cambodia, Taiwan-China, Hong Kong-China, Indonesia, Iran, Iraq, Laos, Lebanon, Myanmar, Nepal, Japan, Pakistan , Philippines, Sri Lanka, Thailand. Thus, just develop Vovinam in several other countries, Vietnam has the right maneuver to put it into Asiad martial. In theory it is, but in fact the movement in many Asian countries is still very thin, yet strong foundation, no team coach high level, even a little place only two dozen martial training officers to attend SEA Games standby. Still, according to Mr. Le Quoc An, Permanent Deputy Chairman World Vovinam Federation (WVVF) and Chairman of the Vietnam Vovinam Federation (VVF), dream playground put Vovinam in Asiad but also many obstacles, but there be a reality. Putting the Vovinam in Asiad was introduced to the biggest sports event the continent a culture unique martial arts of Vietnam, and the achievement of Vietnam’s sports delegation could also significantly improved. Naturally we have to invest in Olympic sport, but to win the gold medal is not an easy thing (we have only 1 gold medal in Asiad 17). If investment funds Vovinam with not much but highly effective as well as issues that should be the Sports sector concerned.